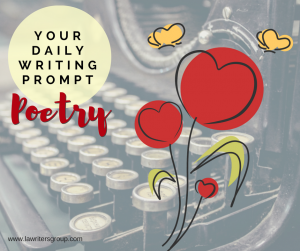 This week’s prompts focus on expanding your poetry repertoire. Experimenting with different forms of poetry can be fun and a great way to express yourself. For this week, I recommend writing by hand only. Today we are working with free verse poetry. Free verse poetry is exactly what it sounds like: freedom in verse. When writing free verse poetry, you aren’t constricted by anything, not by any meter nor rhyme scheme, nor do you need to tell a story with a beginning, middle, and end (like yesterday’s prompt, narrative poems). That doesn’t mean it shouldn’t have rhythm. Free verse poems often embrace a natural or intuitive rhythm rather than a prescribed one. Write a free verse poem today. I’d love to read your poems! You can post your daily writing exercises in the comments section of the blog post if you’d like or you can post on our Facebook group. Or you can keep them to yourself. It’s all fine with me. You can write about yourself or apply these prompts to your character. You don’t have to follow the prompt exactly; it’s more important that you get words on the page today. Visit our blog every day. Add our blog to your favorite RSS feed reader. We use Feedly. Subscribe to our blog which will send you an email every morning with the previous day’s blog post(s).